NVIDIA introduced the first G-Sync PC gaming monitors with 144Hz refresh rate at last year’s CES. It has now announced to extend the G-Sync support to other monitors compatible with the FreeSync technology of AMD. A total of 12 FreeSync monitors have been listed to get the G-Sync support. The support will be pushed via a software upgrade, with no requirement of any extra hardware. Also, NVIDIA has rebranded the G-Sync HDR to G-Sync Ultimate. G-Sync Ultimate is an adaptive sync technology that matches the frame rate of a monitor with NVIDIA graphics card by using specialised hardware. The technology is similar to the AMD’s FreeSync tech. The G-Sync programme is now classified into three tiers – G-Sync, G-Sync Compatible, and G-Sync Ultimate. The monitors that support AMD’s FreeSync are labelled as the G-Sync Compatible. According to NVIDIA, around 400 monitors have been tested and only 12 of them were found eligible. It plans to test 100 more monitors in the near future to check if they are compatible with G-Sync or not. The twelve FreeSync monitors which are confirmed to get G-Sync support are Acer XG270HU, Acer XFA240, Acer XV273K, Acer XZ321Q, ASUS VG258Q, ASUS XG248, ASUS VG278Q, ASUS MG278Q, AOC G2590FX, and Agon AG241QG4. 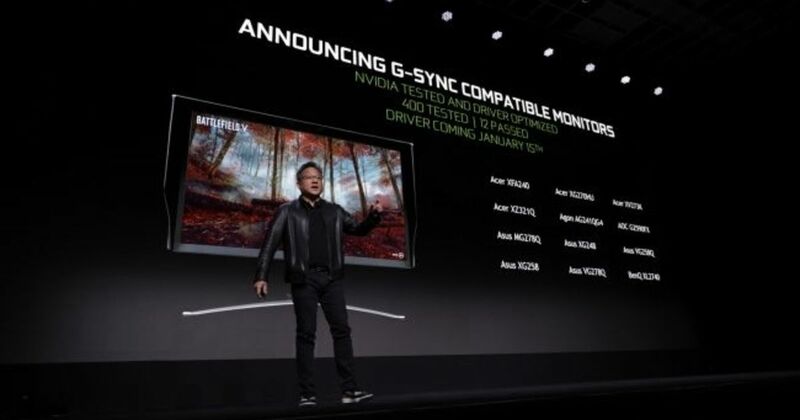 NVIDIA also says that the G-Sync Ultimate technology will be brought to the 65-inch G-Sync HDR monitors that are rated as the Big Format Gaming Display (BFGD). The first manufacturer to bring the BFGD will be HP, which will bring the technology with its Omen X 65. The monitor will feature an inbuilt NVIDIA Shield TV, 120Hz refresh rate, and luminance of 1000 nits.